Jerusalem is a city in the Middle East, located on a plateau in the Judaean Mountains between the Mediterranean and the Dead Sea. 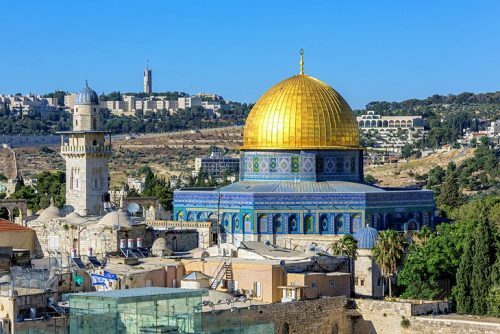 It is one of the oldest cities in the world, and is considered holy to the three major Abrahamic religions—Judaism, Christianity, and Islam. 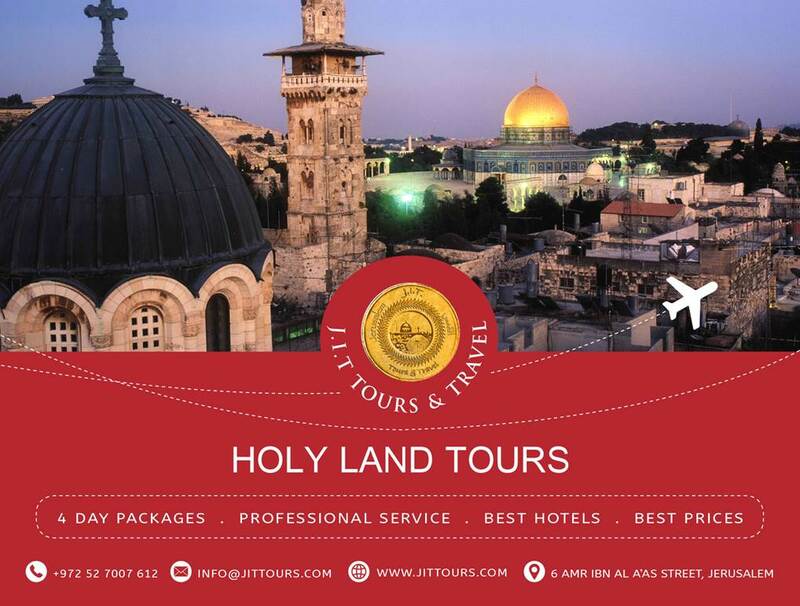 Inside the Old City, as well as the areas surrounding the Old City, such as the Mount of Olives and Mount Zion are filled with religious shrines and archeological treasures. Spend a morning on the Mount of Olives and visit the Church of the Ascension, the Pater Noster Church, and Dominus Flevit. Walk down the Palm Sunday road and visit the Gardens and Grotto of Gethsemane. After lunch spend the afternoon on Mount Zion visiting the Church of St. Peter in Gallicantu, the Dormition Abbey, and the Last Supper Room at the Cenacle. In 538 BCE, the Persian King Cyrus the Great invited the Jews of Babylon to return to Judah to rebuild the Temple. Construction of the Second Temple was completed in 516 BCE, during the reign of Darius the Great, 70 years after the destruction of the First Temple. 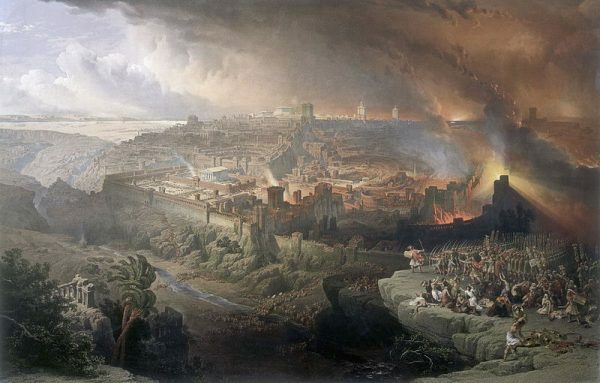 Given the city’s central position in both Jewish nationalism and Palestinian nationalism, the selectivity required to summarize some 5,000 years of inhabited history is often influenced by ideological bias or background (see Historiography and nationalism). ]The periods of Jewish sovereignty in the city’s history are important to Israeli/Jewish nationalists (Zionists), who claim the right to the city based on Jewish descent from the Israelite Kingdom of Judah, of which Jerusalem was the capital. In contrast, Palestinian nationalists claim the right to the city based on modern Palestinians’ descent from many different peoples who have lived in the region over the centuries, rather than those from a particular period. 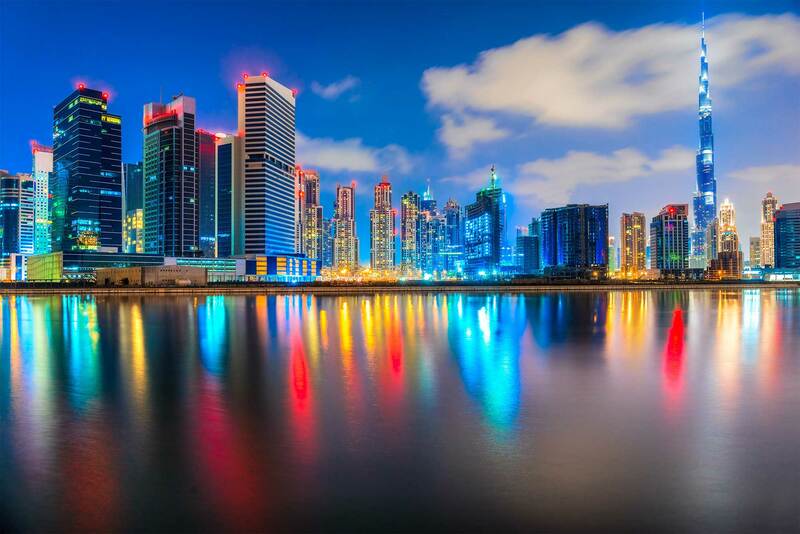 Both sides claim the history of the city has been politicized by the other in order to strengthen their relative claims to the city, and that this is borne out by the different focuses the different writers place on the various events and eras in the city’s history. Any city, Jerusalem included, can be defined either in current administrative terms, as the area declared by legal means to be part of a municipality; or in historical terms, as the city which resulted from a process of urban development, united into one entity by a common territory, history and by virtue of its natural and social characteristics. The administrative inclusion of several outlying towns and villages after 1967, which are not fully and organically included in the social, economic, and political fabric of Jerusalem proper, creates confusion regarding any definition of the city of Jerusalem. This spreads to any related issue, such as defining the age of the city. Jerusalem is totally unique – there is no other place like it. A city of tradition, religion, and history, but also, increasingly, of modern culture and heritage, it is a city with so much to offer that you could spend years here and still not see everything. In December 2007, Jerusalem had a population of 747,600—64% were Jewish, 32% Muslim, and 2% Christian. At the end of 2005, the population density was 5,750.4/km2 (14,893/sq mi). 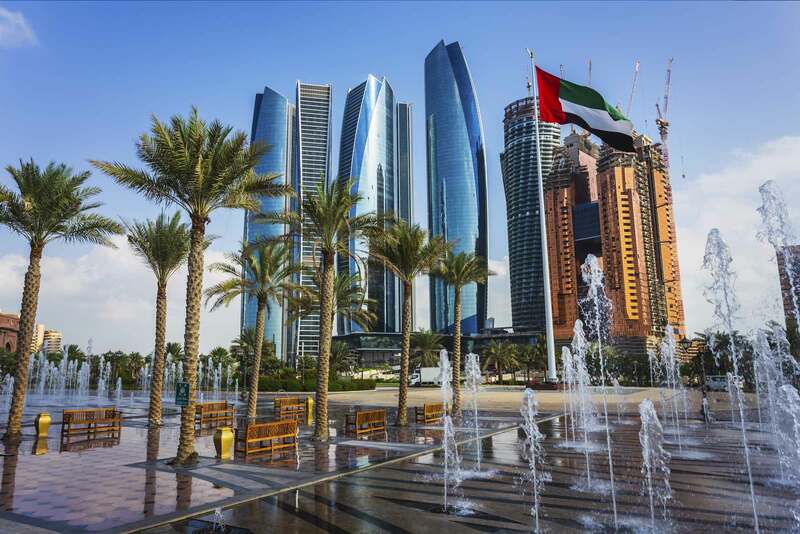 According to a study published in 2000, the percentage of Jews in the city’s population had been decreasing; this was attributed to a higher Muslim birth rate, and Jewish residents leaving. The study also found that about nine percent of the Old City’s 32,488 people were Jews. Of the Jewish population, 200,000 live in East Jerusalem settlements which are considered illegal under international law. In 2005, 2,850 new immigrants settled in Jerusalem, mostly from the United States, France and the former Soviet Union. In terms of the local population, the number of outgoing residents exceeds the number of incoming residents. In 2005, 16,000 left Jerusalem and only 10,000 moved in. Nevertheless, the population of Jerusalem continues to rise due to the high birth rate, especially in the Haredi Jewish and Arabcommunities. Consequently, the total fertility rate in Jerusalem (4.02) is higher than in Tel Aviv (1.98) and well above the national average of 2.90. 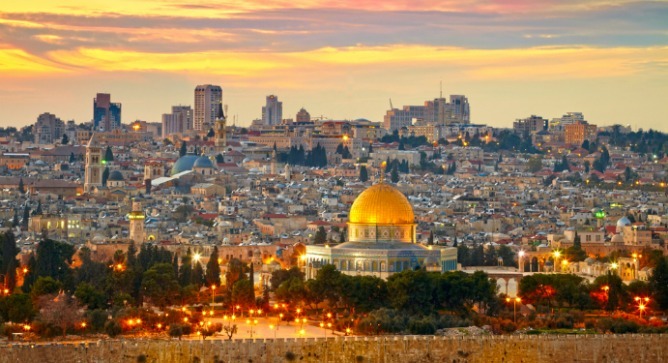 The average size of Jerusalem’s 180,000 households is 3.8 people. Follow in the footsteps of centuries of pilgrims, and enter one of the holiest sanctuaries on earth, where the Prophet Muhammad is said to have ascended to heaven during his early years of preaching Islam. Haram Al Sharif is widely considered the third holiest site in Islam. Revered as the Noble Sanctuary, the location of Muhammad’s journey to Jerusalem and ascent to heaven. The wide plaza, above the Old City, is centered around the glittering Dome of the Rock, which is Jerusalem’s most iconic landmark. where Muslims also believe the Prophet Muhammad began his journey to heaven. The southern side of the mount is home to the Al-Aqsa Mosque, said to be one of the oldest mosques in the world. During different periods, the city walls followed different outlines and had a varying number of gates. 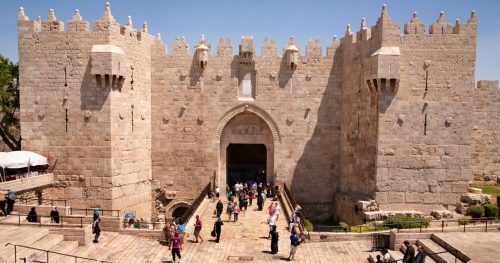 During the era of the crusader Kingdom of Jerusalem for instance, Jerusalem had four gates, one on each side. The current walls were built by Suleiman the Magnificent, who provided them with six gates; several older gates, which had been walled up before the arrival of the Ottomans, were left as they were. As to the previously sealed Golden Gate, Suleiman at first opened and rebuilt it, but then walled it up again as well. The number of operational gates increased to seven after the addition of the New Gate in 1887; a smaller eighth one, the Tanners’ Gate, has been opened for visitors after being discovered and unsealed during excavations in the 1990s. The sealed historic gates comprise four that are at least partially preserved (the double Golden Gate in the eastern wall, and the Single, Triple, and Double Gates in the southern wall), with several other gates discovered by archaeologists of which only traces remain (the Gate of the Essenes on Mount Zion, the gate of Herod’s royal palace south of the citadel, and the vague remains of what 19th-century explorers identified as the Gate of the Funerals (Bab al-Jana’iz) or of al-Buraq (Bab al-Buraq) south of the Golden Gate). Until 1887, each gate was closed before sunset and opened at sunrise. Al-Haram Al-Ibrahimi is located at the southeast corner of modern Hebron and in the heart of its old town. It is considered the fourth holiest site in Islam and the second holiest site in Palestine. 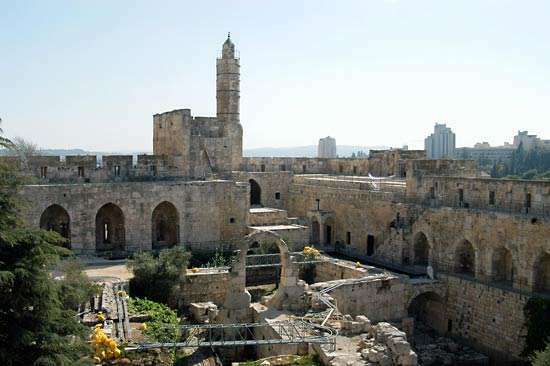 Al-Ibrahimi Mosque was built within an enclosure originally constructed by Herod the Great, who ruled over Palestine during the early Roman period (37–4 BC). It is built of large drafted ashlars (the largest is 7.5 x 1.4 meters) and is 15 meters high. Masjid Omar in Bethlehem is located on the west side of Manger Square, across the square from the Church of the Nativity. 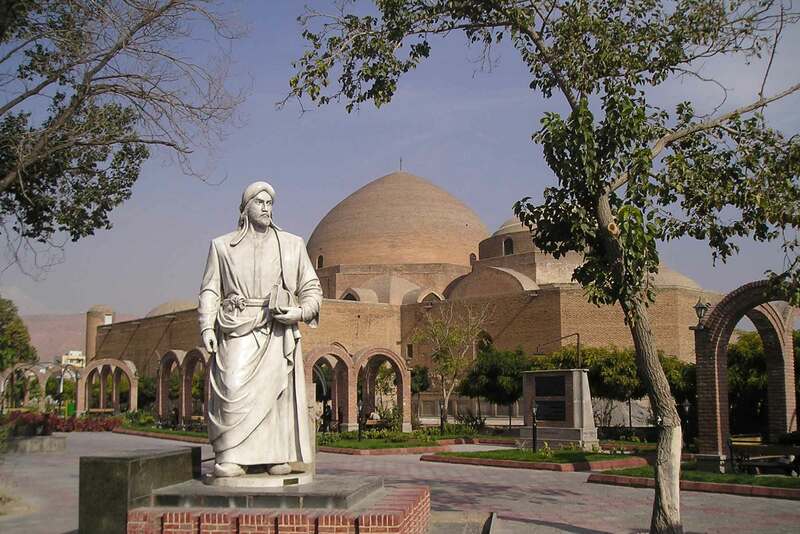 The mosque is named after Omar (Umar) ibn al-Khattab (c. 581–644), the second Rashidun Muslim Caliph. Omar had travelled to Bethlehem in 637 CE to issue a law that would guarantee respect for the shrine and safety for Christians and clergy. Sabich is an incredible tasty dish of grilled eggplant, boiled potatoes and eggs, salted cucumber, tahina, salads and amba (spicy mango sauce). This Jerusalem food is usually stuffed in pita bread. The best place to unwind a long day is Meejana Lounge. Meejana Lounge is a contemporary style lounge, located on the top floor of the St George Hotel Jerusalem, Featuring an outdoor terrace and overlooking a breathtaking view of the old city of Jerusalem. Meejana Lounge offers appetizing dishes, drinks and an exceptional atmosphere that combines authenticity with modern style. Hummus is ever present a proper Jerusalem meal. 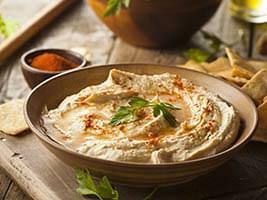 And one can’t truly say to have tried hummus until having visited Holy Land, as Jerusalem has some of the best hummus places in the country. This is a blend of chickpeas (usually dry chickpeas, left to soak overnight), top notch quality tahina, garlic, lemon, salt and good quality olive oil. Also there are other kinds of hummus, for which other beans are used. Shwarma is the carnivore’s budget alternative to falafel in Jerusalem. It consists of a stack of thin slices of meat (usually beef or lamb) skewered vertically and spun slowly in front of a roaster. And it is then served pretty much in the same way as falafel. The unmissable snack to be eaten in Jerusalem is falafel. This is a ball of chickpea meal with fresh herbs and spices. Next, they are deep fried and eaten alone or stuffed in a pita along with some salad, tahini (sesame paste), hummus and possibly pickles. Also, a falafel sandwich makes the best meal on the go in Jerusalem. A visit to Jerusalem will not be complete without tasting “Jerusalem Kaek“, this light snack is sold by many in the streets of Jerusalem. It is made of dough and Sesame. 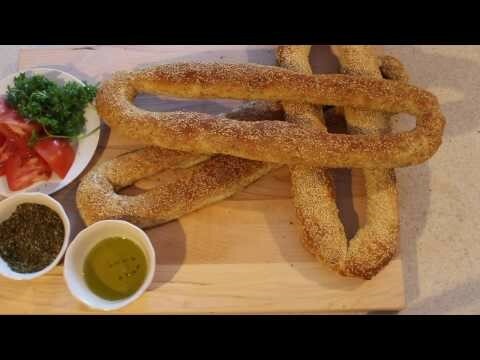 The soft dough is made as a circle shape or elongated shape. It is eaten with boiled eggs, Falafel or cheese by stuffing one of these ingredients inside it, and with a bit of salt.